After work I had to go pick up Nat from this place she was at. While waiting for her to finish I parked my car infront of a building in the area, played some Jimi Hendrix on the stereo and just chilled. The building I was parked next to reminded me a lot of the buildings you find in Lebanon. It's an old building but it was in good condition. It had a large balcony that went from one side of the building to the other, something you don't see that much of here in Kuwait. The ceiling of the balcony also had wooden planks, something I have never seen before in Kuwait. Some small trees were also planted outside giving the place a very soothing feel. So sitting there in the car, windows rolled down, roof wide open and a nice sea breeze blowing, it just really felt like I was back in Lebanon. 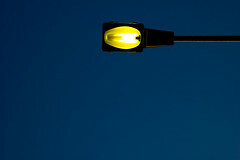 While sitting there day dreaming, I look up into the sky above and right on top of me was this lamppost. My sunroof kinda framed a shot of it and I was like yeah this looks interesting, so I took out my camera and shot this picture. I am generally into new stuff like the latest gadgets, the latest cars etc.. but I don't like old classic cars, antiques and stuff. The only exception to this is with old architecture. I just find older architecture more interesting and more colorful then the current modern stuff. The other day I was noticing the Phoenicia hotel color scheme in-front of Muthana Complex for example and I just loved it. The whole building used to be white but the balconies on the inside were baby blue. It was a perfect balance and I am sure it must have looked really fresh back in the days. If I ever built a house I would probably go with that style myself, all white except the inside of the balcony would be baby blue. i wish you all the best on your project man, i like what your doing and that camera your using is cool. keep me informed if you got something new coming, about a pic of you guys it was just for the record.. but its all good. if i had the time and the equipment ill start my own project i know alot of good places too shoot. what is it the blue color these days? true faith, what do you mean? hi gigi, well there are a couple of things to solve your problem. 1) increase the ISO of the camera. During the night I usually shoot at 400 or 600iso, this will allow more light to come into the camera. 2) bright lens. my lens is a 50mm 1.8F lens. Check and see how bright your lens can get. Its usually 2.8 and up with regular cameras.